A woman from Decatur is in stable condition after being struck by a car when she was assisting a relative who had been in a car accident. The woman remains in the hospital in Gainesville. She was assisting her family member who had been in an accident and was out of her car checking on them when a Honda Civic approached them. It was raining, and the driver says he didn’t see the car until the last minute. He swerved to miss the vehicle but sideswiped the car and struck the woman in the process severing her leg. The driver stayed at the scene and charges are pending in the case. Over the last 10 years, over 5,000 people have been killed in Florida while walking. Poorly engineered roads and inattentive driving have contributed to the statistics, but regardless of the cause, it is easy to see why such accidents could result in severe or even fatal injuries. Dart out accidents that occur when a pedestrian suddenly runs into the road, leaving the driver insufficient time to react. This could be the fault of the pedestrian, but in some cases, it is the fault of the oncoming car, such as when a pedestrian walks out into a crosswalk but the view of them was blocked to an oncoming car by a parked vehicle. Intersection accidents happen when a pedestrian tries to cross an intersection and the driver doesn’t have time to react. 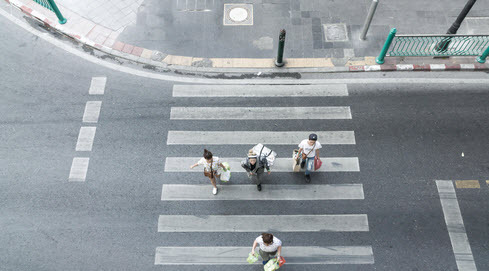 Passing accidents happen when a driver can’t see a pedestrian because another vehicle has stopped to let a pedestrian cross and the negligent driver attempts to pass the stopped vehicle and strikes the pedestrian in the process. Vehicle merge and turn accidents occur when a driver is focused on merging into traffic or making a turn and fails to see the pedestrian. Vendor accidents happen when children run to catch ice cream trucks or people gather around other food trucks. Back-up accidents happen when a driver backs up and strikes a pedestrian that was behind them. Many of these accidents happen in the daylight and are often the result of distracted driving. Distracted driving is defined as a driver who is driving while also using an electronic communication or other electronic device, talking to passengers, reading, eating or drinking, grooming, adjusting the radio, daydreaming, or looking at something else other than the road. If you have suffered injuries due to a pedestrian vs. car accident you could be entitled to damages. While Florida drivers are required by law to have at least $10,000 in insurance coverage, this may not even cover the cost of minor injuries. An experienced Florida personal injury attorney may be able to review your case and negotiate a settlement with the insurance company. A settlement may include compensation for medical bills, prescriptions, therapy costs, lost wages, pain and suffering, and loss of enjoyment of life. The Boca Raton attorneys at the Leifer Law Firm have over a decade of experience helping their clients receive the compensation they deserve after suffering injuries at the hand of a negligent driver. Contact us today to schedule a consultation at one of our convenient Florida locations.